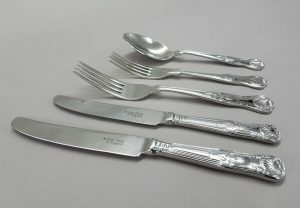 King’s Pattern 18/0 – A classic english favourite which gives that regal feel. 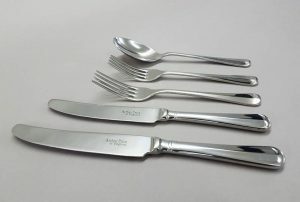 Harley 18/0 – A plain cutlery engraved with straight lines to add to your table setting. 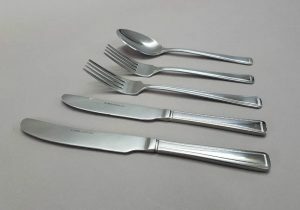 Rat Tail 18/10 – Another traditional favourite, a substantial and weighty cutlery ideal for those extra special occasions. 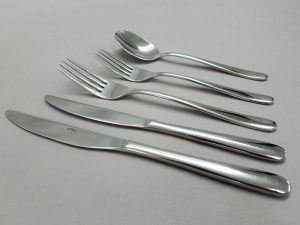 Zephyr 18/10 – A stylish, modern cutlery with generously round heads, ideal for those extra special occasions. 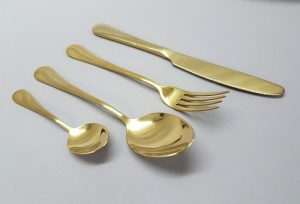 Gold Cutlery M/W – A new exciting addition to our cutlery range, giving a luxurious feel to your event, cutlery that makes a statement! 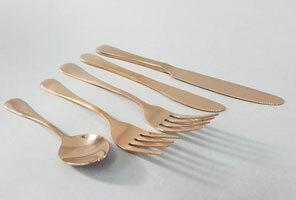 Rose Gold – A new favourite for a brides wishing to add a a touch of colour.